An exciting and fun tour on top of the Mýrdalsjökull Ice Cap. Everything you need for a safe and comfortable ride is provided. This tour gives you the opportunity to go up on the top of a glacier. The Mýrdalsjökull glacier is Iceland's third largest glacier and covers the volcano Katla. To get up to the roots of the glacier we will take you up the mountain in a real glacier truck (about 30 min each way). Once there we'll get on our snowmobiles and ride up the ice cap. From there we can enjoy the glacier landscapes and scenery over south Iceland (weather dependent). 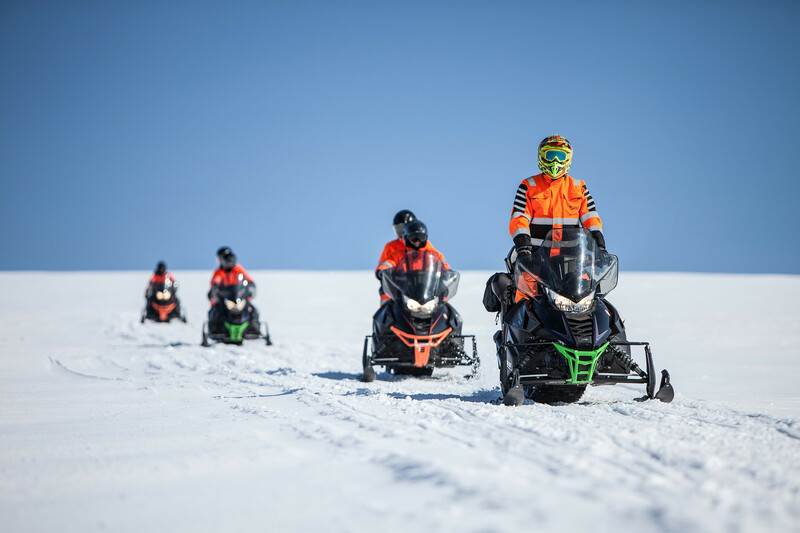 Everything needed for the tour is provided and our expert guides will teach you how to handle the snowmobile to enjoy this adventure in a fun but safe way. The duration of the tour is suitable for first time riders. Please note: This tour is operated by our partners at Arcanum Glacier tours. To ride a snowmobile you need a valid driver's licence. Single riders and groups with odd numbers are required to book a single ride snowmobile.